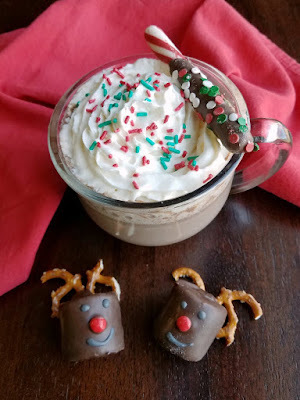 These Rudolph the marshmallow reindeer are so cute and the perfect accompaniment to your mug of hot cocoa! Make them for friends, neighbors, teachers and yourself! I don't know about you, I have really been enjoying hot chocolate week! 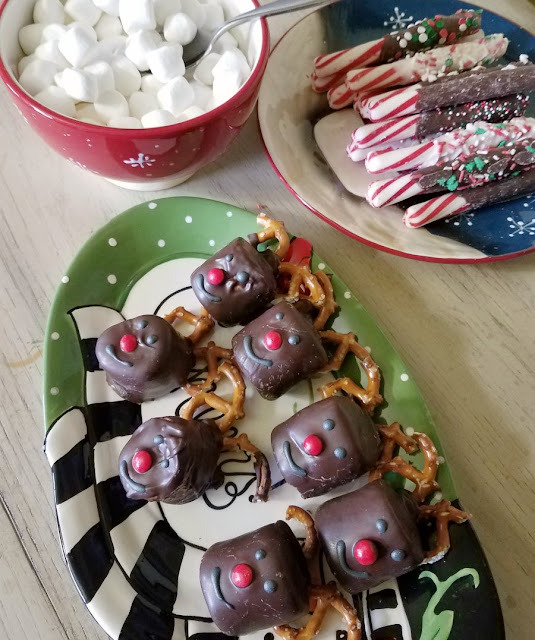 These cute little Rudolph marshmallows are a perfectly giftable treat to go along with all of the hot chocolate. They are perfectly snackable too if you just can't give them away! Any respectable Rudolph needs some antlers. 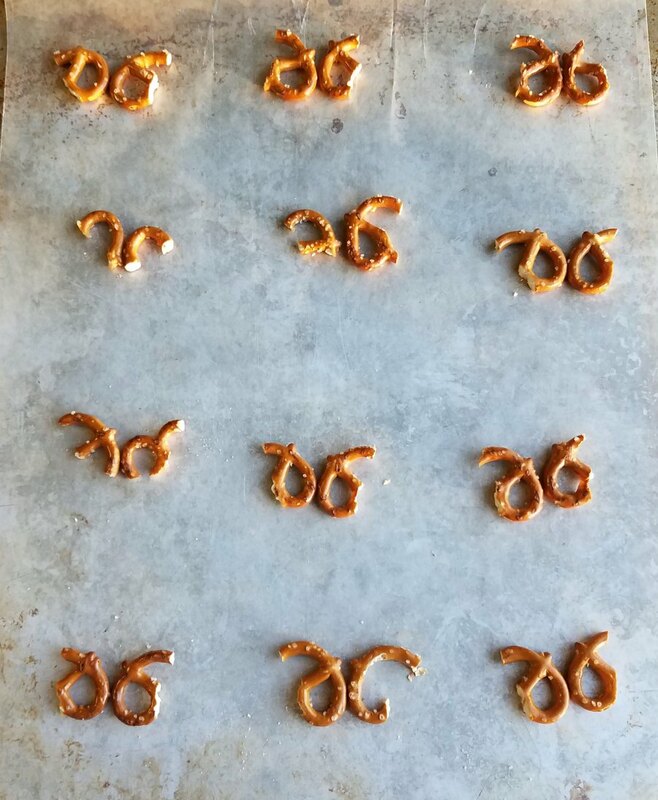 Just break a mini twist pretzel and stick the broken sides out and you are ready to go. But what should we use to hold them together? Chocolate, of course! 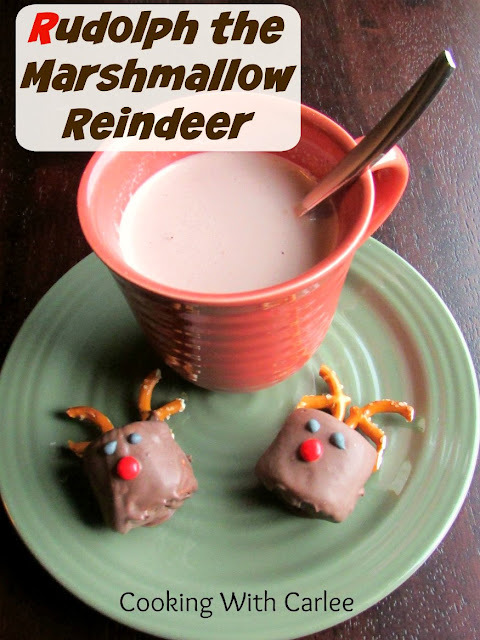 Next the marshmallows get dipped in chocolate and placed on their antler base. A red hot nose lets you know who is leading the way this Christmas! You could certainly use candy eyes, but I just piped on some black royal frosting that I had already made to do Rudolph's snowman marshmallow counterpart. In just a few quick and easy steps you are ready to go! Aren't they just the cutest?! Melt you chocolate in a double boiler. 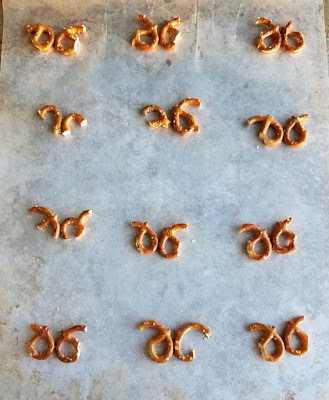 Break pretzels in half and arrange on a baking sheet lined with wax paper. Use a dab of melted chocolate to hold the pretzel bits together. 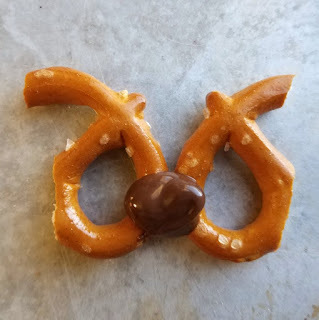 Dip a marshmallow in the chocolate and place on the bottom part of the pretzel antlers. Place a red hot on the front center of the marshmallow for a nose (add eyes now too if you are using candy eyes). Once chocolate is set, pipe on eyes and allow to dry completely. This is such a cute idea and who wouldn't love to get these as a gift?! Thanks for sharing at Share The Wealth Sunday and I hope you'll join us for an all new party tonight! 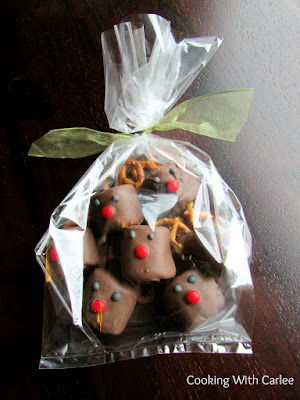 I would almost feel guilty for eating these cute lil' guys...almost!!! Ha! I'm sure they don't mind! How could these not be a Friday Frenzy favorite? They are just so gosh darn cute...I still think I'd feel guilty eating them...at least a little bit! Thank you! They are definitely cute, but tasty too!